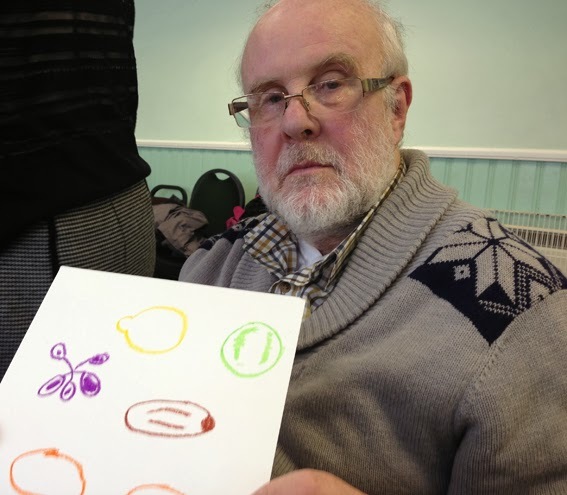 Yesterday we were working on the project Making Memories, with older people (many with dementia) living in Oldham. Reminiscence, poetry and drawing were inspired by the smell, look and touch of 'fine' chocolate and exotic fruit. And of course the taste. So how do you encourage someone to DRAW, when they might not have picked up a pencil for years? The environment is very important - a bright, warm, quiet, familiar room is helpful for people, particularly those with dementia. A room in which there will be few distractions and interruptions, a 'safe' environment, where people can 'risk' putting pencil to paper. It can be very frightening to make a drawing. Fears abound: all of us people hate being faced with our own limitations - art making can feel like a big reveal of oneself, particularly if ill. So getting to know each other and the group leader/volunteers is really important. Make introductions in a friendly and informal manner and emphasise that there is no Right or Wrong, just the adventure of the process. Small is beautiful. Most people benefit from smaller groups at some point in an activity, particularly if living with dementia or hearing loss. Trusted volunteers and staff are invaluable to encourage people to contribute to a creative activity. Small groups allow the artist or group leader to give more time to each participant. This enables personal-centred care, allowing people to build confidence. Celebrate achievements, however small they might at first appear. 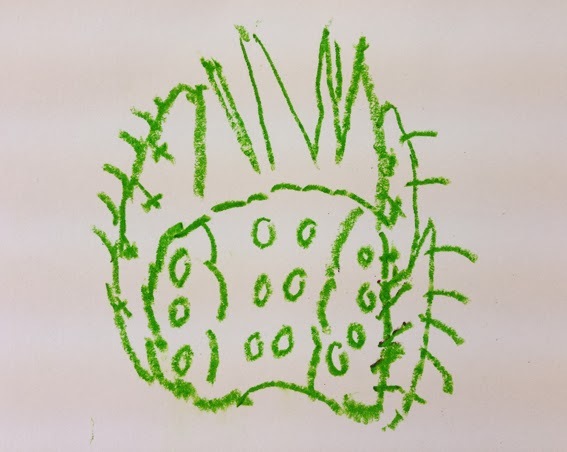 Phil and I often work with people knowing little or nothing about their health background, unaware 'til after the session that for some picking up a pencil and making one single mark on a piece of paper can be an enormous gesture of faith. Seeing people taking many minutes to write a single word is a humbling experience. A careful balance has to be struck; it's important not to be condescending. Timing. Our sessions are typically 2 hours, including one tea break. For people with some health conditions like advanced dementia 1 hour is long enough, particularly when you are all getting to know each other. Flexibility is all important, if an activity is going well, flow with it. If you feel you are banging your head against a wall, move onto something else: time for an all-important Great British Tea Break? Regular tea breaks and biscuits are very popular and at times vital. Everyone has good and bad days, health problems or not. Sometimes folks are simply not in the mood for making, sometimes pain or discomfort is just too distracting. Try and try again, but possibly tomorrow or next week. Reminiscence can combine beautifully with creative work. However, like art making itself, memories can be painful, we never know what may trigger a deep felt sadness. A smell, a photo that might seem innocent, can upset someone else. Be led by the participants, if they want to talk something through and it's not upsetting the rest of the group, let them. Don't be scared of going into these areas because they can bring intimacy and also release, but never push and if someone wants to move on, move on. We always try to end on an optimistic note. Subject matter. Pick your subject matter and materials with great care, they are crucial ingredients. Making Memories is all about how looking and handling materials can stimulate not just reminiscence but creativity. Yesterday we were playing with all our senses. 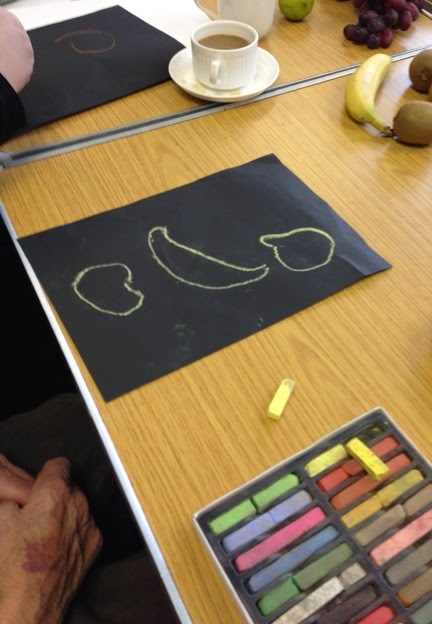 Tasting activities are easy to share, don't necessarily require language and conversation (one woman I worked yesterday made it very clear how much she liked the food samples with an array of mmmms) and can be a great way for people with dementia to participate. In many ways, taste is the most pleasurable of our senses. Fruit looks great too, the familiar shapes and bold colours are terrific to use as basis for drawing, which is why there are so many paintings of bowls of fruit in art galleries. Yesterday we provided an array of fruit and paper, oil pastels and soft pastels to draw with. Participants were encouraged to loosen up, not to worry to much about end results but to enjoy the process. With encouragement, most of the group picked up the art materials and joined in, many drawing for the first time in years.